A print-and-paper themed post for my Easter Treats series. 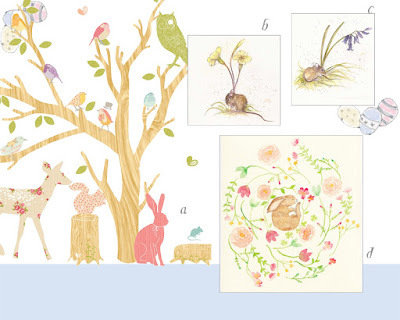 Wall stickers, cards and a lovely print make up today's selection - all by designers and artists I love. b. and c. Two delightful cards from one of my all time favourite artists Kate Wyatt. Visit her website for original art work, prints and cards. I've picked the mice here as I think they are so lovely for spring, sitting as they do beneath their woodland flowers, but she paints hares too and they are stunning. Go and have a look! d. This delightful bunny print is called Peace. What a lovely name. Catherine at Bumpkin Hill creates charming illustrations she works up into prints, cards, and lots of paper ware accessories (think cake toppers, party bags, bunting...) She lives and works in Belgium but her heart is in England and she happily ships over here at very reasonable rates. Visit her lovely website here.